Sayrah is a new Singaporean company who have recently launched their website. They provide clothing including skirts, tops and dresses, as well as hijabs and accessories. I was sent the Serena lace top with belt to review. This top is really comfortable to wear and is fully lined, so you can get away with minimal layering. The sleeves are opaque although they don't have an extra lining, though in strong light and flash photography they may appear sheer. On me, the top hits just above the knee, so is great for wearing with straight-cut trousers. The lace along the hem, especially where it overhangs the fabric, is very delicate and easily damaged, and threads do have a habit of coming loose. I was really impressed by this top from Sayrah and it's definitely become one of my wardrobe favourites. The design is simple yet the little touches like the lace and button sleeve make it feel really special. And not forgetting of course the fact that it ticks all the boxes in terms of being hijab-friendly! 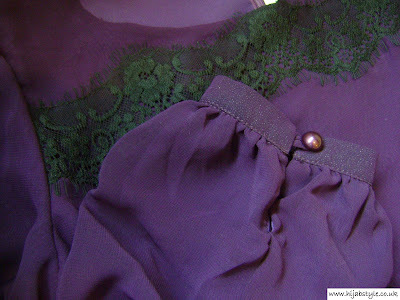 pretty top.. :) love the color.. Thank you so much for this review. We're so glad the design, fabric and overall cut fluidly fits well. We are looking forward to hearing more feedback from everyone for our design refinement moving forth. I like this it suits a lot of women . I wish there was more fashionable yet beautiful modest clothing available in places like us and canada like tops that cover the bottoms .